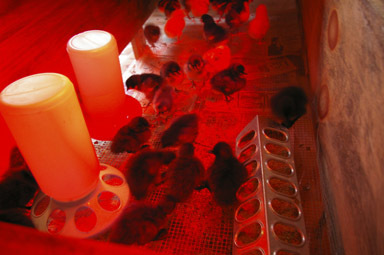 Despite my spending last week in bed with the flu, the chicks and the ducks managed to focus their attention on growing. The two groups have mostly separated, though I think it's because the chicks still need the heat lamp while the ducklings are happier gathering in a warm group in the corner. 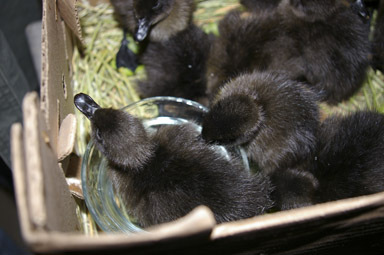 The ducklings are growing faster than the chicks, but they also arrived larger. In the same room, tomatoes, peppers, celeriac, onions, shallots, and broccoli are all getting started under the growlight. Even though this is New York State, in spring 2008, it's not, really. I was supposed to have a nice box for the arriving chickens built Sunday, in a room I'd just finished flooring. Instead, I got wildly sick and I've had a hard time staying out of bed, never mind doing construction. 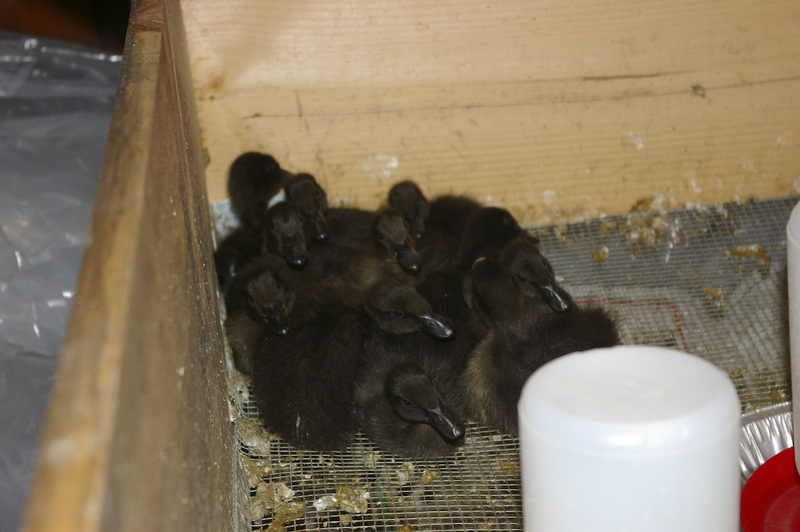 That means our newly arrived chicks and ducklings are sharing last year's quarters. Hopefully I can get the new one built this weekend, and the ducklings and chicks will have enough room for considerable future growth. Of course, the chickens and ducks had to arrive when I was barely able to get out of bed to go find them at the Post Office, though both the postal employees and McMurray Hatchery were very helpful. The chicks arrived Monday - 19 Silver-Laced Wyandottes Angelika will be taking to the orchard, plus 6 Buff Orpingtons we ordered for Mary Ann Sumner. (She picked them up today, so there's already more room in the box.) Twenty-five chicks in the box I'd built for six worried me, but they seemed perfectly happy about it at this stage in their development. The ducklings, Cayugas, arrived this morning. The Post Office actually called at 4:23am, but I didn't hear the call. I'm very impressed that they'll do that, though! It was nice picking them up. Other customers seemed to brighten as I walked out with a peeping box of happy noises. I gave the ducklings water to drink before putting them in the brooder box, but of course, they had other ideas about what to do with it. Duckling in a custard cup. I'm reminding myself sternly that at some point in the not too distant future I'll be eating some of these fluffy creatures, as I think I really only have room for six. Eventually I'm going to have to get used to that even with the laying hens, but for now it's quite amazing just to watch the ducklings. Fortunately, they seem to get along with the chicks perfectly well. When I've separated the chicks, I'll look into giving the ducklings a little swimming pool with ramps in and out. 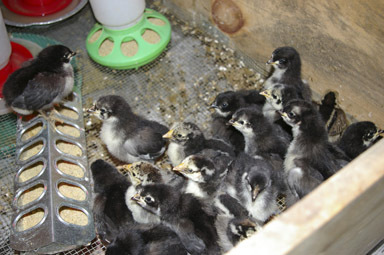 For more happy pictures, see the gallery of this year's chicks and ducklings. We're really not trying to join a trend, honest. I guess it just makes sense for a lot of people at this point. Wow. That was in the fashion section. Yikes! When we put apple trees in the front yard, I felt like a strange pioneer. I hadn't heard of other people doing that, beyond the occasional fruit tree, but now apparently everybody's doing it. It's nice to see a trend I can happily support!